All zodiac signs have different traits and characteristics, so knowing your partner’s zodiac sign can help in catering to their needs. For example, water signs are emotional, so they need a lot of assuring and comforting, whereas earth signs require someone stable and independent. It all depends on your partner’s individual sign, so to figure out their needs, read below for more information. Aries like honesty, above all else. If you choose to get into a relationship with an Aries, make sure you can provide an open platform for communication, as these rams don’t like to beat around the bushes. They are a very bold and transparent sign, so they need someone who will tell it like it is, 24/7. They don’t like to play mind games and try to read people – they’d rather the other person lay it all on the table so they don’t have to do any guesswork. Aries also needs someone strong, independent, and driven. They also require someone who will take them on adventures and keep life exciting, as Aries have pretty short attention spans. Taurus’ are usually strong, silent types who will say everything’s fine on the surface, but in reality, they’re hurting pretty badly on the inside. They aren’t good with expressing feelings, so as a partner, your job is to help your lover communicate their emotions. Taurus needs someone who they can feel comfortable around, as talking about feelings isn’t their strong suit. They need someone who won’t mind digging a little deeper to uncover a Taurus’ real thoughts and feelings. Geminis tend to flit from one thing to another, so they need someone who will help direct their thoughts and keep their emotions in check. Geminis can seem a bit flighty and wishy-washy, but really, they just have so many different interests and thoughts that it gets difficult to manage them all. If you have a Gemini partner, make sure you keep things exciting for them, as they can lose interest pretty quickly. They also need someone who will make them laugh, as they have a very cheerful, upbeat vibe. In a relationship, Cancers will give everything – their mind, body, soul, heart, home, clothing, and dog just to make you happy. They never hold back, and shower you with love and affection. However, due to their nurturing and deeply sweet nature, they have very high expectations for others. They are idealists, so they have a powerful image in their minds of how they want their partner to behave. When he or she doesn’t meet these expectations, then extreme hurt and disappointment ensue. They get this feeling a lot, probably as no surprise to any of you, as they wear their hearts on their sleeves. They pour their whole being into a relationship, so they just want someone who will show up fully in a relationship and give them the love and attention they’ve been desiring. They have no energy to settle for anything less at this point. Leos have a carefree, confident attitude that anyone can smell from a mile away. In a relationship, they need a partner who will also display this sort of behavior, as they don’t want anyone who will hold them back or not give it their all. Leos have a goofy side, but they require serious relationships. They don’t want to play games; they want the real deal. If you choose to date a Leo, make sure you come with the right intentions and don’t hold back, as this sign can spot insecurity and lack of confidence quite easily. Virgos, despite having an analytical and logical nature, also have a tender heart deep within. However, they don’t let too many people see this. They would rather approach life with a practical mindset, but sometimes, their emotions get in the way. However, in a relationship, a Virgo needs someone emotionally available, but not someone who lives totally in their feelings. They want a balance, so that they can have intellectual discussions as well as talks about emotions, too. Virgos also value loyalty and honesty, so don’t let them down, or you may have hit the end of the road with this sign. Libras need peace and tranquility in a relationship in order to even consider something serious down the road. They don’t want anyone to come along and mess up their positive vibes and peaceful nature, so make sure you have your energy aligned if you want to hang with a Libra. They believe in equality and justice for all, and want that in a relationship, too. Scorpios may have trust issues and hold everyone at arm’s length, but they have their reasons. They may have been hurt a lot before, or they just tend to be suspicious of everyone until they prove themselves. So, in a relationship with a Scorpio, you need to show them that they can trust you early on if you want any chance of the relationship progressing. They only open up to those who make them feel comfortable, so make sure you don’t betray them. Scorpios love to get revenge, so watch out. Also, if you happen to pass a Scorpio’s love test, you need to romance them and win them over with your displays of affection. 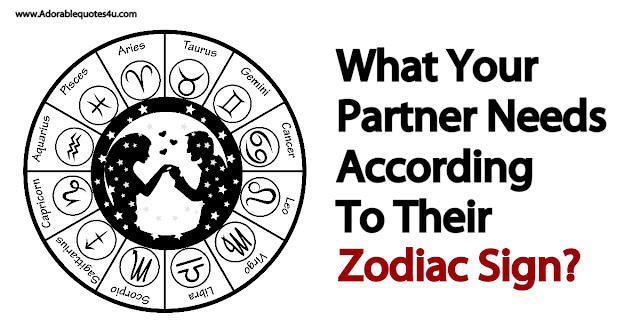 Scorpios are deeply passionate and sensual, and they need a partner who can keep up. Sagittarius loves adventure, quick wit, and philosophical conversations. They also admire someone they can depend on, as they have a restless, lost soul that needs a bit of comforting sometimes. As a fire sign, they can anger easily and seem tough to get along with, but they have big hearts. They just need someone who will stabilize and ground them more than anything, while also relating to their childlike sense of adventure and wonder. Capricorns may seem a bit traditional and old-school, but they like it this way. Hard-working and determined, Capricorns need a partner with a strong work ethic who can hold their own in a relationship. However, they also need someone who will show them to slow down and enjoy life before it passes them by. Capricorns tend to be workaholics, so they need someone who can break away from the 9-5 every once in a while and show them a good time. They also need someone who will help them open up emotionally, as they tend to bottle up a lot of their feelings. Aquarius have a lot of different personality traits, and are considered one of the most ‘complicated’ in the zodiac. They love deep conversations, but may seem a bit aloof at times. They are always planning the next adventure, and have a passion for taking spontaneous trips and seeing far away places. They live for the next thrill, and know what they want in life. They have a lot of love to give, but have difficulties laying all their emotions on the table. They don’t normally settle down unless they really like someone, so if they show interest in you, then you know it’s real. Pisces are easily one of the most sensitive, romantic signs in the zodiac. They crave grand gestures and traditional displays of affection and admiration. Flowers, chocolate, sweet notes and whispering kind words in their ear that will melt their heart are all up a Pisces’ alley. They also have a knack for creativity, and need a partner that will support their goals, dreams, and hobbies. They require a lot of emotional intimacy and vulnerability in a relationship, so if you expect it to be successful, don’t hold back. They might need a little help opening up, but once you make them feel comfortable, a Pisces is an open book.